On this blog, I use freely licensed images whenever practical. 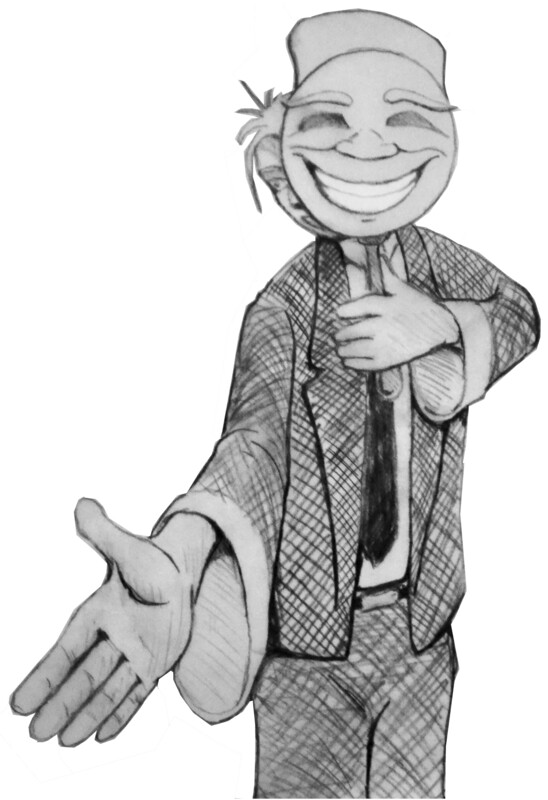 But if that were a rigid policy, I’d be unable to show you this sketch, published by the Friends of the Columbia Gorge in 2002, of the proposed casino location. 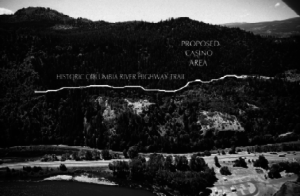 Starting in 2008 I wrote a Wikipedia article on a proposed casino, to be built in the Columbia River Gorge. I wrote the article because I believed it was an important topic (and an Oregonian reporter and a Harvard scholar agreed); but according to an argument by Michael Eisen, advanced yesterday in the Ars Technica article “WikiGate” raises questions about Wikipedia’s commitment to open access, it “should be difficult” for me to write an article like that. Today, the article I started has 17 footnotes; and in spite of my deep personal commitment to open (freely licensed) content, not a single one of the articles I cited was published under a free license. Many are not even available online without a paid subscription. In other words, none of them is an instance of what’s known as “open access (OA) publishing,” in which the publisher permits republication with minimal copyright restrictions. Is it strange that I should write an article that cites non-OA articles? I don’t think so. In choosing the topic, I — like many Wikipedians — was making a conscious effort to counter what is known as FUTON (FUll Text On the ’Net) bias. I was specifically trying to shed some light on a topic that was opaque to many stakeholders (in this case, the citizens of Oregon and Washington). A great deal of the information about this important topic was unavailable on the open web; my purpose in writing the Wikipedia article was to bring that information out into the open. Indeed, the result — intentionally — was a freely licensed article published on the open web. In other words, an “open access” article, rooted in non-OA sources. FUTON bias is a fact of the modern world. If some information can be easily found by a Google or Bing search, while other information requires a subscription and, therefore, a more focused search, the openly available information will be easier to find. Wikipedia, a project whose central vision is explicitly devoted to “the sum of all knowledge,” should resist this kind of bias at every opportunity. Eisen’s position is rooted in the long-term effects of using OA or non-OA sources. He was distressed to find that Wikipedia was working with publisher Elsevier, to help them give 45 Wikipedia volunteers free access to otherwise non-free scholarly articles. To be fair, Eisen did not argue that Wikipedia editors should never use proprietary databases, or that we should avoid citing copyrighted source materials altogether. Rather, his position is that Wikipedia as an institution should not endorse free access for Wikipedians to such databases, and that Wikipedia as a publication should not include links to articles that are unavailable on the open web. But even this position overlooks Wikipedia’s core purpose. Although Wikipedia values openness and free licensing in both its editorial culture and its policies, the very first policy states that Wikipedia is an encyclopedia; as such, Wikipedia is devoted to all knowledge — not merely knowledge whose expression meets a certain criterion of openness. When I discussed this with Eisen on Twitter, it turned out his position was rooted in a concern that access would be given out in consideration of how much Wikipedians link directly to Elsevier’s articles. But that is not the case. The page outlining the conditions for gaining access explicitly states that Wikipedians “must follow scholarly and/or Wikipedia best practices when using those source (sic) for their work“. Furthermore, access to the free accounts is approved not by an Elsevier or even a Wikimedia Foundation employee, (correction: in the Elsevier case she does work for the Foundation, unlike some other access partnerships) but by a longtime Wikipedia volunteer. I asked her; she affirmed that she considers only the stated requirements when giving out the accounts. All in all, I think Wikipedians and OA advocates alike can agree that the discussion prompted by the article was worthwhile and healthy. But the outcome, I believe, illustrates that when Wikipedians take on a project that could conflict with closely held values, they have usually thought it through. That’s not to say Wikipedians always get it right, or that there’s no room for debate; but on licensing issues in particular, I think Wikipedia usually does a good job of balancing complex, and sometimes competing, concerns. This entry was posted in core, Free licenses, governance, history, journalism, open educational resources, Oregon, systemic bias, wiki, Wikipedia, Wikipedia and education. Bookmark the permalink. A proven innovation could benefit Facebook’s users—and its shareholders, too.